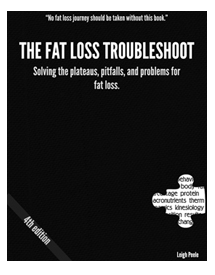 Fat Loss Troubleshoot is actually a fat loss optimization guide, created by Leigh Peele. This is not a diet book. There is no a strict nutrition plan to follow. Fat Loss Troubleshoot will provide you with a solid base of knowledge to help obtain your ideal physique. You will discover exactly what is going on inside your body and how to achieve and maintain fat loss. This system is suitable for all those who are struggling to lose weight, even though they seem to do everything right and those who have reached a plateau with their fitness goals. Leigh Peele specializes in balancing your hormonal function and “fixing” your metabolism, during calorie deficits. Leigh Peele is a certified NASM personal trainer and a certified AFPA nutritional counsellor. She has worked with many celebrities and both advanced and beginner athletes. The Fat Loss Troubleshoot: this is 4th edition of the 180-page manual. Here you will discover information on caloric intake, macronutrient types, training styles and protocols and much more. The Fat Loss Troubleshoot – Audiobook: this is the MP3 format of the book. F80 - Fat Loss Program: this is the training part of the program. Goal Sheet: here you are going to set your weight loss and fitness goal and track your progress. Body By Eats - Preview Cookbook: you gain access to some of the best recipes of Body By Eats. Leigh Peele clearly states in the manual that calories do count. In order to lose weight you have to determine your caloric needs and create a deficit. There is no other way. However, the secret to fat loss is to eat meals that taste good and make feel satisfied with fewer calories. Keep in mind that there is absolutely no reason to avoid carbs, fats or salt. There are no forbidden foods in the Fat Loss Troubleshoot diet program. Salt may increase water retention, but doesn’t make you fat. Very low carb diets only seem to work better, because they cause big initial drops in water and muscle glycogen. Fat, even saturated fat is not all evil either and it won’t increase you weight if your overall calorie consumption is moderate or low. Leigh Peele also dispels other myths, like the myth of meal frequency and the myth of age-related metabolic slow-down. The truth is that you don’t need to eat 5 meals a day to lose weight. There is no evidence that this behavior increases metabolic rate. As for the notion that metabolism slows down with age, it seems that inactivity and the loss of muscle tissue that comes with it is the main reason for this phenomenon. For more information, visit The Fat Loss Troubleshoot!